A ceramics fair with leading regional and national ceramicists, plus workshops and demonstrations. Next event: Sunday 25 August 2019, 10am to 4.30pm. THE LIST OF EXHIBITORS IS ON THE 2019 TAB. You can also look at what we did in 2018. Ceramics in Southwell is organised on a not for profit basis. 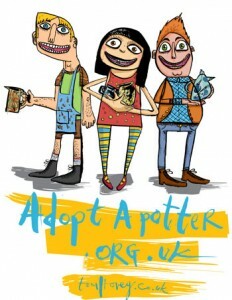 Supporting the Charity Adopt a Potter.